A four-strong group of Sleaford gymnasts came through with flying colours when they competed in the Regional Grades Championships earlier this month. Sleaford Gymnastics Club members Olivia Thorpe, Oliwia Winiarska (both grade 3), Gabby Greig (grade 2) and Kennedy Shelley (grade 1) managed to impress the judges enough to all pass their gradings. 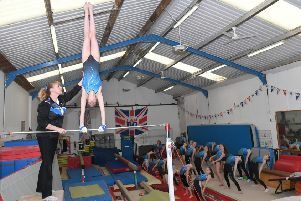 The gradings consisted of set skills at various levels, with gymnasts judged on the vault, bars, beam, floor and a range and conditioning routine to show strength, flexibility and control of essential skills. The girls worked extremely hard building up to the event, as well as the 100 per cent pass rate, Gabby and Kennedy passed with commendation, with Kennedy bringing home the silver medal and Gabby taking fifth place. * Sleaford Gymnastics Club also sent a big squad to the Tulips Invitational Team Event, in Spalding. 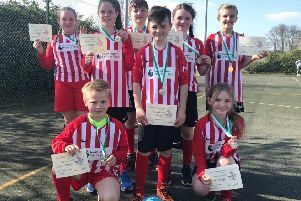 Head coach Sammi Emsley said: “All of the girls were amazing. They executed their routines beautifully, performing new skills and routines and, for some, higher levels. Team: Gabby Greig, Lucy Rudd, Olivia Thorpe, Molli Wilson (3rd out of 10 teams). Individual: Gabby – 1st vault, 2nd bar, 3rd floor; Olivia – 5th bars. Team: Rebecca Fletcher, Erin Scott, Louise Hirst, Kennedy Shelley (4th). Individual: Rebecca – 2nd bars, 3rd floor; Louise – 4th vault; Kennedy – 4th bars, 5th beam. Team: Natalie Forsyth, Amy Patchett, Oliwia Winiarska, Emma Randall (gold). Individual: Natalie – 4th beam; Amy – 4th bars, 6th vault; Oliwia – 2nd bars; Emma – 1st vault. Sleaford second team: Faye Bristow, Isobelle Harvey, Kaci Sambridge. Individual: Faye – 1st bars; Kaci – 3rd bars. Sleaford third team: Sophie Bastow, Maisie Goodbourn, Alice James. Individual: Sophie – 4th floor.